Look on my works - and despair ! No need for parody here. What's a 'real' dip? $1190 - $1150 this morning not count or are you talking in riddles? it's a dip, it's a dip ! we're all agreed ! I missed the gold price this morning in my caffeine-free stupor. I have form buying into 'dips' in gold. I think it was around March 08 when it rose to $1030 or so, then 'dipped' down to $970 and wobbled a bit. I ran out the of the office, got on the blower and bought 40oz, then got home to find myself $400 poorer. How did they managed to hide the news until the US markets were closed, when earlier the markets were saying something was being prepared for? I looked at that aerial photo a few years back and thought it sick making. The epitomy of pride before a fall - an outright excess of hubris. How can there be an 'excess of hubris'? 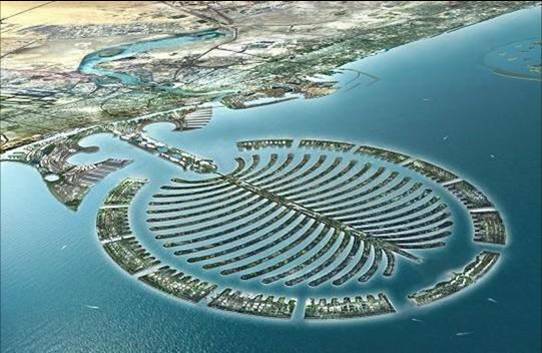 Dubai property is a real south sea/tulip bubble. And I hope it won't be the last. Dubai makes hubris look timid. What on earth is the point of the place? It owed its existence to perpetual construction and once that ceased it had no reason to exist.